Our favorite moment together was definitely our first dance! we had a blast performing it together in front of our loved ones! At the end of the night, the DJ played “Don’t Stop Believing” by Journey. He then asked everyone to give my husband and I a giant group hug. It seems corny, but it was the perfect end to a perfect day! Our first dance! As I mentioned in a previous section, we spend months learning to ballroom dance, and our instructor put together a choreographed routine for us. We love re-watching videos of our first dance and hearing everyone’s comments in the background! My husband and I were both travelers before we met, so naturally we kept traveling even after we started dating. 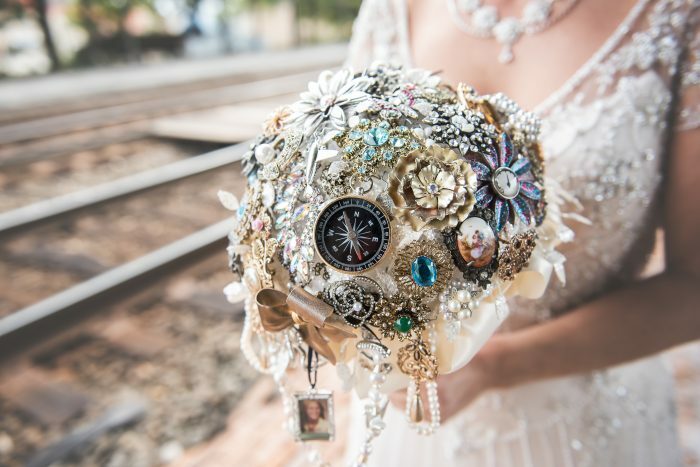 We incorporated our love for travel into every detail of our wedding! The bridesmaids dressed as vintage airline stewardesses equipped with mini suitcases and pillbox hats, while the groomsmen wore map ties and silver wings on their jackets. 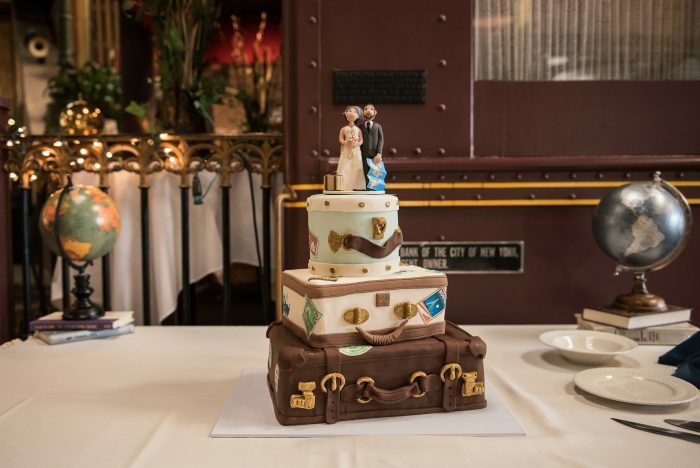 Our wedding cake was a 3-tiered suitcase cake, and our guest tables were countries instead of numbers equipped with travel trinkets, pictures, and foreign currency! Even our venue was a train station with real trains running overhead! We are planning a summer trip to Africa in 2019! 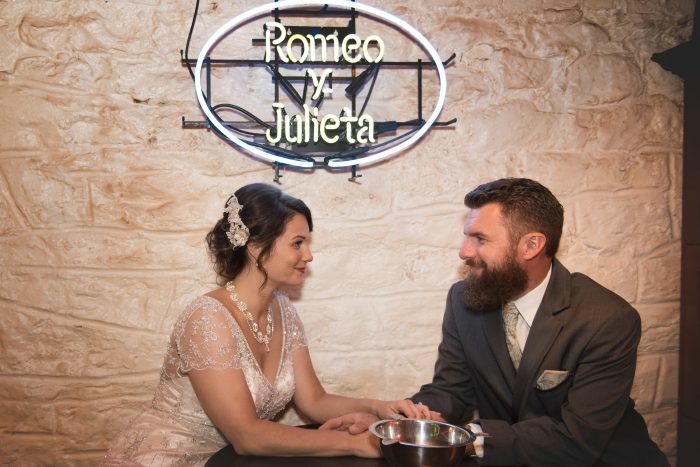 Since our wedding was travel themed, we had to add a lot of personal touches to our decorations and search antique shops all over to find what we wanted. It took a lot of time and patience, but we browsed through so many amazing places and met so many people along the way! We were also able to relive our travels when planning the guest tables and finding pictures and trinkets to include on them! More traveling! I love that I now have a forever travel buddy! We both have such different ideas of how to travel, so it’s always an adventure to mix our styles. For example, I like to have the trip planned out in advance, while my husband flies by the seat of his pants! 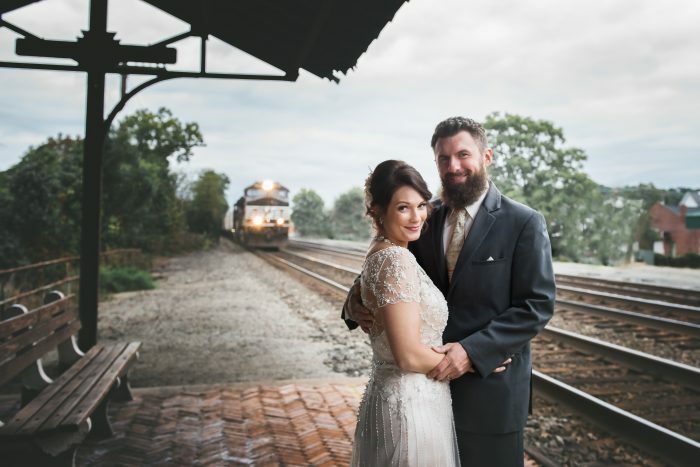 When we met with the photographer, we told her, if possible, that we wanted a picture with an oncoming train. After capturing some shots, we finally had our chance! Those trains are way closer and louder than you think! This photo was taken at our venue in Latrobe, PA at DiSalvo’s Station Restaurant. It’s one of my favorite photos…our bridal party nailed their poses! When I was at MB Bride in Greensburg, PA trying on dresses, I put on this Maggie Sottero Amal dress. One of the staff members walked by and said, “That’s so Gatsby!” I knew then that this was my dress. I love the vintage look of it, and I couldn’t get over all of the details on it! Our rings were all purchased from James Allen. I always told my husband I wanted something “different,” and he didn’t disappoint with this unique engagement ring! 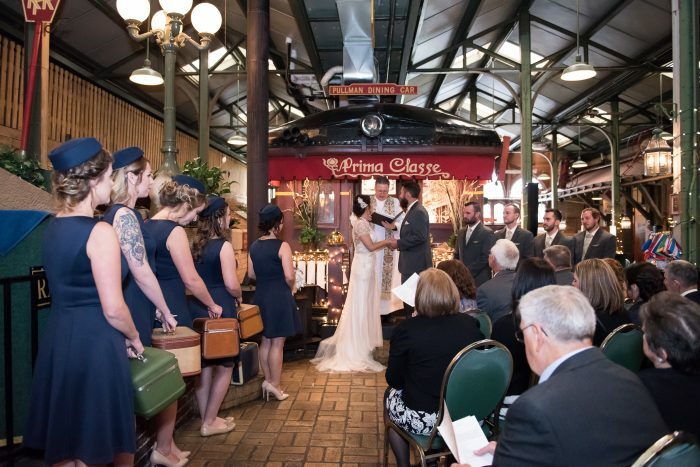 Our ceremony took place at DiSalvo’s Station Restaurant on the back of a train! It was the perfect setting for our travel-themed wedding! After seeing this idea on Pinterest, I couldn’t resist this gorgeous idea! My cousin put in countless hours to put this piece together! As for centerpieces and decorations around the reception, we went with succulents in goblets to go with the vintage feel. Our reception was held in the same venue as our ceremony at DiSalvo’s Station Restaurant in Latrobe. 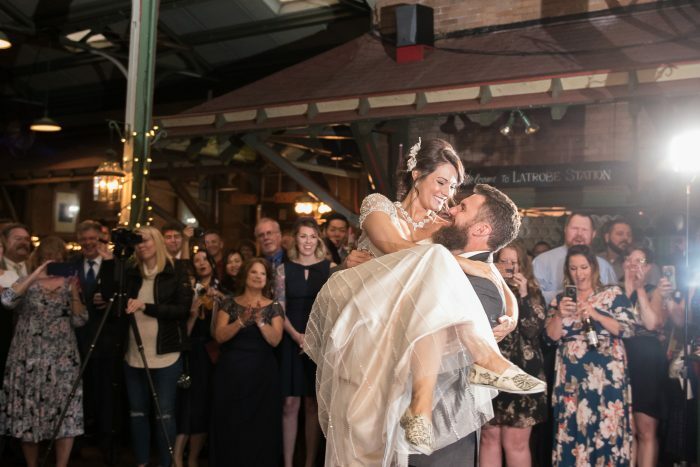 With a train inside (that housed our cookie tables and photo booth) and real trains running overhead, we couldn’t resist getting married here. This is a picture of our wedding cake, made by Gwyn Zollinger of Happy Camper Cakes. We couldn’t have asked for a better, themed cake. And it was delicious! Our first dance! Not only did we learn something completely new together (ballroom dance! 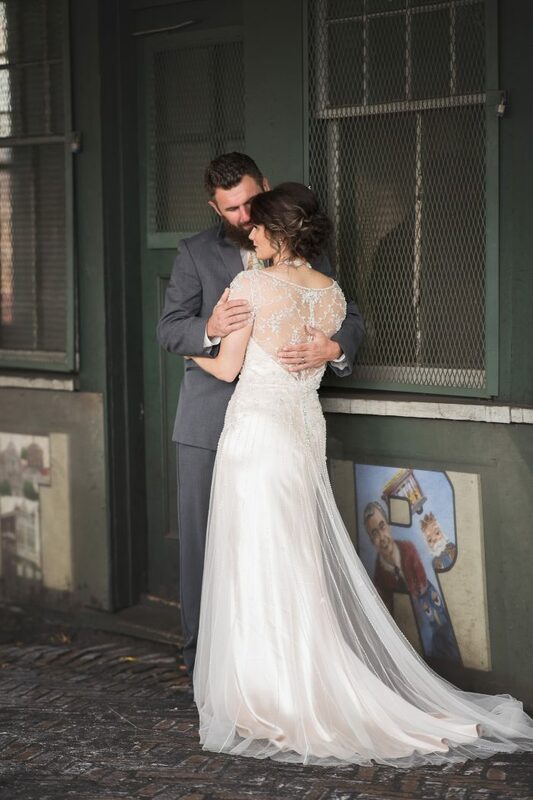 ), but it really was one of the most magical moments of our day! This was such a hard decision! 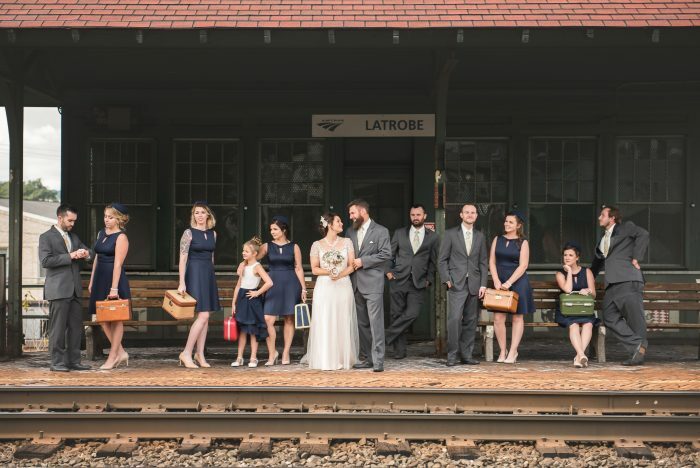 Our bridal party picture on the platform is by far my favorite, but since I posted it in an earlier section, I also love this picture. This was taken in the cigar bar at the venue. It’s such a cool little area with neon lights and a little nook that makes you feel like you stepped back in time!